You’d have to look really closely (and, likely, hold it against a white background) to notice, but this martini I just made has a very subtle pink hue. Which is solidly out of character for me. Usually once a glass holds more than just gin and a dainty splash of vermouth, I don’t go in for calling it a martini any longer. I’m an annoying purist in that way. But since this twist is SO subtle, almost hidden, and doesn’t mess much with the classic foundation, I was willing to give it a whirl. And still call it a martini. Inspiration came from the farmers market, where the season’s harvest of beautiful, just-harvested heirloom radishes are showing up. I love radishes and eat the basic grocery-store bunches year round. But I definitely indulge more over the summer when selections really blossom. Why I haven’t gotten some radishes into my own garden yet, I don’t know, clearly should add that to my planting list. 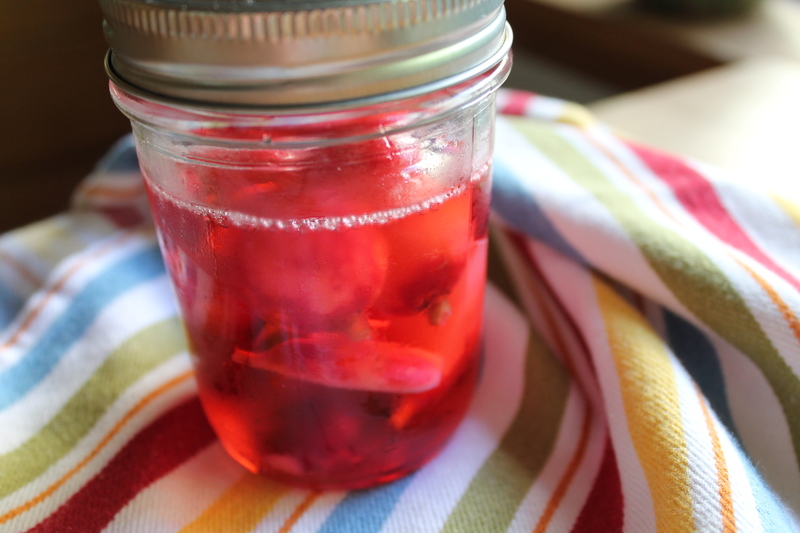 Having played around with quick-pickling vegetables in the last few years (including a bowl of quartered mushrooms that will have pickled for a few hours to be part of tonight’s salad entree on a hot Seattle evening), I wondered about a twist on pickled radishes. Hmmm. Beyond vinegar. What else? A quick glance from the kitchen to the liquor cabinet brought to mind vermouth. Which, of course, brings to mind favorite uses of vermouth. Which, extra of course, brings to mind a chilled martini. Nothing earth-shattering, there’s not much to this. This would be ideal with small enough radishes that you can leave them whole. And leaving a bit of the green stem tufts on the top adds a bit of visual contrast. I halved the medium radishes and put them in a small jar. Because I had some just-picked bay leaves on the counter, I tossed a small leaf in the jar too. Just enough dry vermouth (I use Dolin) to cover, seal the jar, in the fridge for a day. As expected, the pink-red hue of the radishes seeped into the vermouth as the radishes absorbed the vermouth, retaining their distinctive crunch. Certainly using pale colored radishes would reduce that outcome. After 24 hours, they were good to go, though I’ll be sampling from the jar for further observation over the coming days. 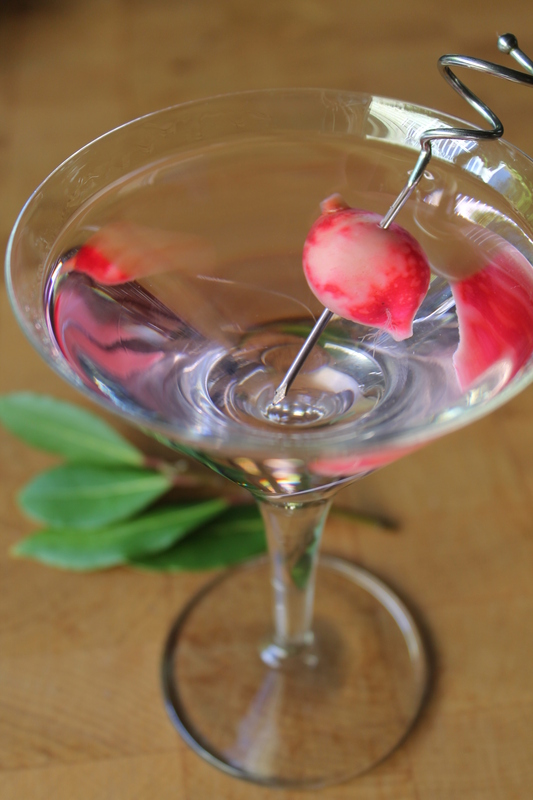 A splash (I used a generous teaspoon) shaken with gin to chill, one of the radish pieces skewered for garnish, and I think this is a quite delightful seasonal martini. Not dominantly radishy, there’s just the merest dose of peppery character from the radish. With the bonus of the crunchy-vermouthy garnish to nibble between sips.